Most of East Asian weather at the moment is freezing, especially Japan where there has been lots an lots of snow over the last weekend. Take some time to warm yourself with a piping hot miso soup of news from the land sprung forth from the reeds! First order of business: election results! The Liberal Democratic Party of Japan (LDP) won 290 seats, relying on the Buddhist-rooted New Komeito party’s 35 seats to reach a double majority in the Kokkai (Diet). That probably means that economic revival will be in the cards and that a new mandate has been reached for that, although the lack of a complete LDP-only supermajority means that their coalition partner will look very angrily at them for any security/nationalism stance changes. I think the current election results is a bit of a Goldilocks situation. Yes to economic reform and making Japan more dynamic, and taking the big-company gains of Abenomics and spreading them throughout the economy, which was a central issue in the election. No to free-rein nationalism that will make Japan’s trade partners very cross indeed. Also, more inside-LDP support for Abe now that his party and coalition has a more secure voter mandate (at 35% voter turnout, probably the lowest any politician has been able to draw on to claim a national mandate for anything). Futures markets seemed to be treating this news with marginal but important negativity (Nikkei 225 below 17 000, USD/JPY below 118) until something else happened: the BOJ quarterly Tankan survey came out largely positive! The big manufacturers diffusion index was a bit disappointing (12 vs. exp./prior 13) but big non-manufacturers were much more positive (16 vs 12 exp., 13 prior) and small manufacturers were positive (1) rather than the rather negative expectations (-3), although small non-manufacturers were negative according to expectations at -1, crimped probably from higher non-commodity input prices. The best news however were probably an indication that capex is solidifying at a higher level, coming in at 8.9% vs prior 8.6% and expectations of 8.0%. Higher investments when input prices are largely flat or down means that there is a larger increase in productive assets than this number would otherwise indicate, and thus the forward productive capacity of Japan looks set to be much higher than others are seeing. A higher, solid level of capex could very well be the confirmation that Japan Inc. is getting behind Abenomics, and further information on any stimulus package construction and tax reform proposals will be highly, highly welcome, and I am rather convinced that the market – in light of this Tankan survey – will share my excitement! To continue my recap of the last week, here’s the added information of the Japanese markets. The title comes from one stupid index construction – due to price-weighting – used as a bench mark (the Nikkei 225) going higher than another (the Dow Jones Industrial Average) for the first time in a very long time! Depending on how you count it this happened during the late Asian hours on Thursday (when the Nikkei futures traded higher than the DJIA closing price) or on the respective time on Friday when the US employment data had a much bigger effect on Nikkei futures than on the DJIA, thanks to the yen push factor and better expectations of increased exports from Japan to the US. On top of this, Abe Shinzo will look to go into the second and last week of election campaigning this week, against a still completely disoriented opposition. He will go into this on Monday with GDP revision numbers coming out, with Bloomberg forecasts of a Q3 revision to -0.6% from a -1.6% headline numbers. Bank lending and current account numbers will all be out at the same time tomorrow morning (08:50 Japan Standard Time, or 23:50 today, GMT) 40 minutes before the Japanese markets open. I’ll go over a bit more of what the markets might see in terms of data before the election, after I give you a technical outlook on the Japanese markets in general. Nikkei Stock Average, 4-hour candles, futures-implied spot, chart courtesy of CMC Markets. Here, we have a strong momentum play from the last steep trend line, looking to replicate the latter half of October’s trading in terms of points on that parallel line, and a “match” would imply that the rest of the week will hold positive momentum. As I have argued previously, I do think the market will be in wait a bit more for the election, waiting to take positions until after the dust has settled on and markets have opened on Monday December 15th, but the 48/120 hour EMAs plus breaking the upwards trend channel and holding it for more than 8 hours (which is a first!) will undoubtedly provide more momentum. 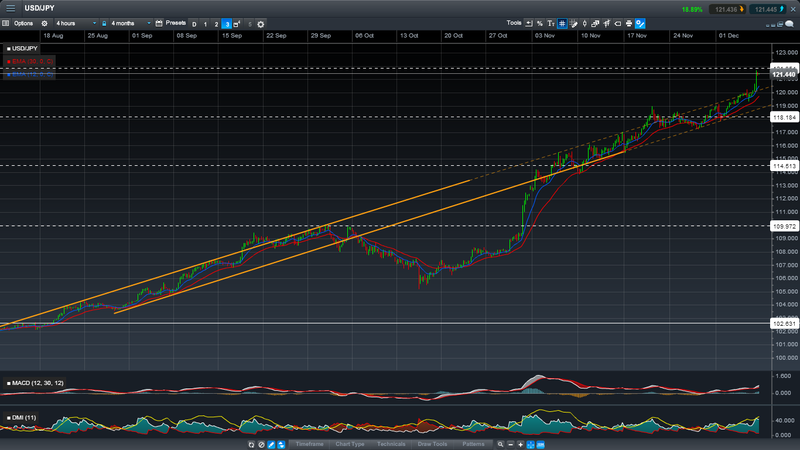 “Following the line” would set an end-week price of roughly 19 000, so that would be interesting to see if it plays out. If 12 hours pass of neutral trading, then the 48 hour EMA and the trend line will really start lending support to price, so this could be interesting to watch. Then, will we get any help from elsewhere? 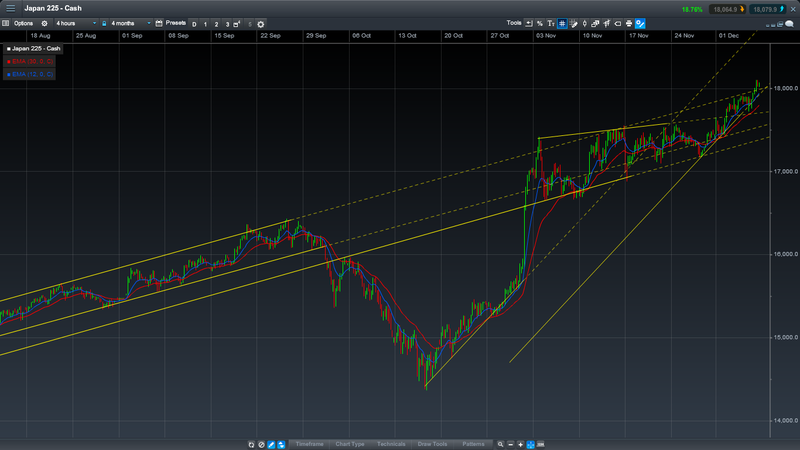 USD/JPY, 4 hour candles, chart courtesy of CMC Markets. The Nikkei does have some catching up to do against the dollar after the employment numbers came out! There’s nearly a 1.5% reaction to the effect of the employment numbers, plus bouncing off the trend channel top, and getting support by the 48 hour EMA. Momentum indicators on the bottom are also indicating strong momentum, but the distance to the established price action is so far that there is the possibility of giving away the majority of those gains again. I also personally believe that the 121.85 level will prove very difficult to cross, given that the other Fibonacci levels from the 2002-2004 USD/JPY downwards move have proven very resilient. 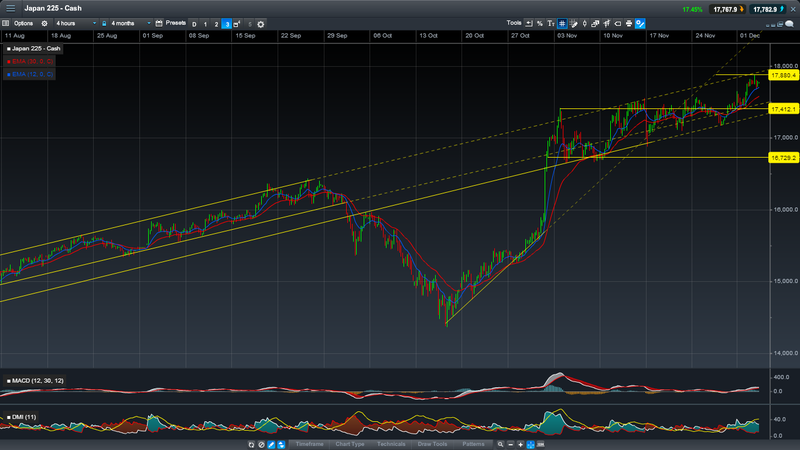 If this is broken though, it sets up tests at peaks near 124.14, and 125.60. Given the previous market action around these levels giving initial breaks that are retreated on, a break should probably only be called after 24 hours of continuous trading above the 121.85 line. I find this to be difficult to support, as good as the US employment data might have been, I think the best that will happen is a quick break above that gets reversed, unless the majority of a Japanese trading day trades price higher after crossing. Time for looking at what data Japan will look into next week then! This, as always, after the jump! Watching this is interesting for certain, but the problem is that we’ve had a massive break lower, followed by a whiplash upwards, and then snapped right back down today. It feels like trying to read patterns into an explosion – exciting and moving but ultimately very dangerous for ones health in proportion to how closely you wish to look. It feels like there isn’t all that much to state before we get a trend in which volume is taking the Hong Kong markets. I do believe “up” will be the emerging power, mostly on the China draft and connection, making the move down a harder momentum play. Smooth as soggy soba! More after the jump! Japan has a few interesting things to look into today, when we got great overtime pay numbers, showing that overtime pay just increased by 0.4% over the 1.6% prior value. This is a great leading economic indicator as it indicates just how much managers are squeezing people on a short-term basis, and might contribute to the long-term hiring picture when more work comes in that is not possible to delegate to short-term increases in overtime pay. That, as much as I would like to deal with it now, is for later. At the moment, let’s get you up to speed on the Japanese election campaign, which officially kicks off today. The economy is seen as the most important election matter (of course, stupid! ), which probably means that the capital expenditure numbers we got yesterday really helps the outlook for Abe Shinzo, not just the economy. In fact, the third quarter GDP will be revised from -1.6% to -0.6% on the back of this data alone, and for many reasons this data is possibly one of the best leading indicators. I will go into more analysis of this later as well, when I discuss the overtime pay picture. What then does the election battleground look like, and what are the likely different outcome scenarios for the LDP and New Komeito coalition that currently rules Japan? Bloomberg has a pretty good summary of this as well, which I won’t go into greater detail on, except to discuss which outcome I see as the most positive for Japan. Having a supermajority of more than 317 seats out of 475 would mean that the LDP could really push through essentially any legislation it wants across all chambers of the Diet, including controversial and disliked foreign policy stances. I think this is really harmful for Japan, and one of the best ways for the country to grow would be to hitch a ride on Chinese growth and exchange know-how for profit opportunities in China. China could replicate the technology, but I have a hard time seeing how it could ever replicate Japanese diligence, management and dedication to results, so Japan will still keep its unique selling points or even extend them. From this perspective, you’ve already done good things to make the likelihood of Asian Majors’ trade and investments better, why risk it by bulking up your military and sounding all nationalistic again? However, as the Japanese political establishment is essentially dysfunctional at all times, a Kokkai (Japanese word for Diet) legislature ruled without an absolute stable majority of 266 seats would be a complete loss of any reform potential. Getting the ruling coalition less than 266 seats would imply a lot of horse trading, and essentially the third arrow of Abenomics remaining in the quiver, never getting shot out. I do believe that the closer the LDP gets to 300 seats, the better (as the mandate would be stronger) but anything over 316 seats would be to more or less ask for a halt of shipments to the biggest export market Japan has. Perversely, as is mentioned in the Bloomberg article, the less voter turnout, the better for the LDP in results. This probably explains why the short notice, since drumming up a proper election campaign and drawing up significant battle lines over questions the Japanese care about deeply (aside from the economy) would probably hurt the LDP prospects. Wow… the ruling Kuomintang (KMT) party, led by Ma Ying-jeou, lost pretty spectacularly and surprisingly in the mayoral elections held here in Taiwan yesterday to the Democratic People’s Party (DPP), led by Tsai Ying-wen. The issue isn’t so much legislative (it wasn’t a parliamentary / general election) but the signal Taiwan sent by making the ruling party lose control of nearly all major cities/municipalities (Taipei to the “independent” DPP-backed People First Party (PFP), and Taichung, Tainan, Kaohsiung to the DPP) was felt throughout like a political earthquake. This led to the PM resigning, and Ma got under the heat of reporters and criticism not long after. General elections will be held in the start of 2016, giving the KMT roughly 9/8ths of a year to turn public opinion around unless Ma wishes to be forced to cede power to the DPP, and I expect politics to go into overdrive to provide good results to boost the prospects of re-election. What has brought this about, given that at least Taipei and Taichung have normally been the industrial / corporate base on which the KMT has stood firm as essentially the rest of Taiwan was sided with the DPP? Ma Ying-jeou has lately been called “Mr. 9%” as a reference to both his low approval ratings (9%) and the “jeou” character in his name which means “9” in Chinese, but even despite this he has managed to score political victories, most notably a reelection in 2012. So, what has changed? Worries of economic stagnation. Wages are not increasing in Taiwan, while house prices and rents are going up and reaching stratospheric levels compared to average salaries. There has been discussions on lower economic growth proving to be a massive funk for the island which it has yet to get out of, despite GDP growing at roughly 3.5% for the last 6-9 months and showing signs of increasing. Fears of China have increased. Partially, this is because a more assertive Xi Jinping has been playing a lot of tones that ring of nationalism which isn’t the best sound in Taiwanese ears, for understandable reasons. Part of it is normal, Asian irrationality and demands for remaining separated and elevated from China by birthright, which are fears that cannot be placated under any circumstance as long as China is growing faster than Taiwan and steadily opening up. Heavy-handedness by Ma. He’s been trying to force a lot of regulation through parliament without broad support, looking more like a CEO responding to owners everyone believes to be Chinese, than a politician genuinely looking out for the Taiwanese people and their interests. “Sellout” is a pretty common slur about Ma these days, or that he’s trying to show progress on unpopular decisions towards a schedule set by Beijing, and the protests in March of this year against the Cross-Strait agreement were probably the standout development in this area. On top of this there have been a few food scandals which obviously, in any lack of perfect handling, gets pinned on the ruling party. Voter fatigue. How many rulers in democratic countries get a second renewed mandate? Sweden failed this even though the economy’s been good, the same thing with the US in the last midterm elections even though there has been a lot more controversial policy to go around in that case. Then what are the chances for that happening in Taiwan which is gradually becoming less and less competitive (thanks largely to a very tightly managed currency against the US dollar) while asset prices are soaring? Here’s what I think needs to be done in the coming ~6 months for Ma to maintain his presidency, which I personally do think is beneficial for Taiwan (both on ideological grounds and as a matter of pragmatism – the “greens” as the opposition is known isn’t a group I think of when someone mentions professionalism and organizational capability). As usual, hit the “Continue Reading” for more!